And while this definition seems basic and obvious, the reality is most of us aren’t mindful. Instead, we spend our time living on autopilot rarely being conscious or aware of who we are, what’s around us, or this life we’ve been given. When don’t live mindfully, we end up feeling disconnected from ourselves, our purpose, and the world around us. Oftentimes this disharmony leads to a negative mindset where we feel unhappy, confused, and purposeless. That’s why practicing mindfulness is so important — it connects us to our true power and purpose. We live in a multidimensional, vibrating universe meaning everything around us (including us!) is made up of energy. And the way energy works is by attracting other forms of energy with a similar vibration. Simply put: you attract into your world what you put out. That’s why gratitude is so powerful — when you say thank you for what you already have, the universe responds by bringing more things into your life for you to be grateful for. Set an intention every day to say “thank you” for 3 things, and you’ll be amazed at how quickly you are given more things to be thankful for! 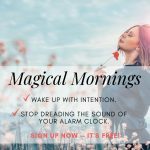 This simple mindful activity can be practiced anywhere, anytime and will immediately lift your vibration and shift your mindset to positive! And slowly, these definitions become our truth. We believe what other people have said and thought about us and accepted their definitions as real, and then we act in accordance with them! We hold ourselves back. We don’t take the chance. We don’t try. We believe we aren’t good enough. And we end up being unhappy, confused, and broken. But, here’s the thing: No one knows who and what you are — except you. So today, take back your power and redefine yourself. Be more mindful and conscious in your life. Throw out the definitions that were given to you, and write your own. Once you create empowering definitions of who and what you are, and what you’re capable of, you’ll start acting in accordance with those definitions and your mindset and life will shift dramatically! One of the best mindfulness activities you can practice on a daily basis is guided meditation. Not only will meditation calm your mind, and relax your body — it’s also proven to reduce stress, anxiety, and depression. What’s more — when you practice meditation regularly you’ll be able to rewire your brain, stop overthinking and gain clarity in your life. Start by using the meditation above, and enjoy feeling calmer, happier and more relaxed. We become what we repetitively do, say, and think. That’s why we have to be careful about how we talk to ourselves. Positive affirmations are a simple, quick, and effective way to create a positive mindset and feel better! You can change your affirmations from day-to-day, but you don’t have to. The key is to choose affirmations that make you feel empowered, inspired, and uplifted! When we spend time in nature connecting with the world around us, we’re able to tap into a high-vibrating energy source while disconnecting from things that distract us and eat away at our energy (like TV, social media, gossip, toxic situations, etc.). Nature allows us to re-immerse ourselves back into the oneness of the universe, and be more present, grateful and relaxed. As often as you can, spend time in nature. Take a walk in the park. Lay beneath the sun. Take your shoes off and let the grass tickle your feet. Listen to the wind, birds, and animals. Most of us spend our lives living in the past or projecting ourselves into the future. And when we do this, we create disharmony in our lives and miss out on truly experiencing and enjoying life. Harmonize your life, and don’t worry about what was or what might be. Instead, get present in the here and now so you can create the life you want to live, and fully experience each moment! Use breathwork to center yourself whenever you notice you’re out of alignment with the now. The easiest, simplest way we can be more mindful and create a positive mindset is to smile more. Now before you roll your eyes, hear me out: when you smile, your body releases endorphins that diminish stress hormones. What’s more — smiling is proven to slow the heart and relax the body. The result? You end up feeling more aligned, happier, and less stressed. P.s. 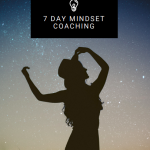 don’t forget to sign-up below and grab your FREE 7-day Mindset Coaching Journal! Don’t delay — start cultivating a positive mindset today!